The Wisconsin real estate market has been chugging along strong for several years now. Well priced and well presented homes are selling quickly and multiple offer situations are occurring. Buyers are in serious competition in some price ranges. Often, FSBO owners sell for less than they would have if represented by a real estate professional. Buyers of For Sale By Owners are out for a bargain. How often have you sold a home? Probably not every week or more like an experienced agent. There are a million things to know and remember. And what if you get multiple offers on your home? That’s a great problem to have with or without an agent. But which offer is the best? It is not always the one with the highest price. An experienced agent can help you select the right offer or negotiate the best one for you. Time is of the essence and the first few days on the market are so important. Professional agents are in touch with clients immediately when hot new listings enter the market. How will you find and inform your buyer? Do you know the disclosure laws for single family homes? What about lead based paint disclosures? Are you familiar with how to negotiate after a problem home inspection? And with what you need to share with future buyers? More time and energy than you think. A good Realtor takes care of so many details behind the scenes. Setting appointments and following up on showings; advertising and checking web traffic; presenting and delivering offers digitally according to deadlines; Dealing with title documents, appraisers, loan officers and so much more. No matter who you are, your time is worth something and you have a life to lead. Consider hiring a professional who does this everyday. 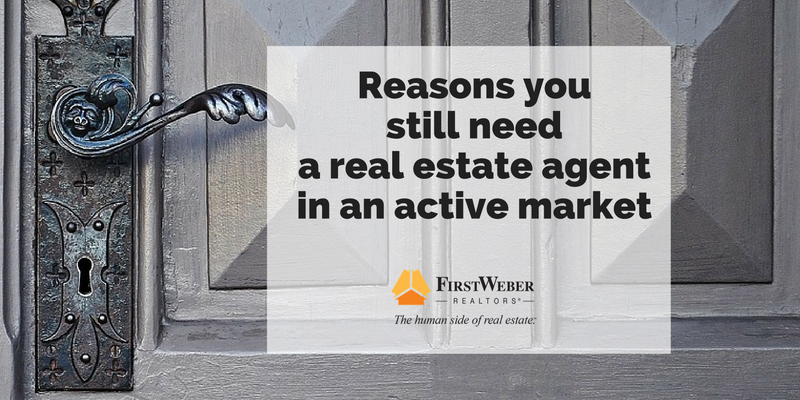 If there was ever a time you needed the help of an agent it is now. You’ll need the guidance and advice to make your offer stand out in a competitive market. Get a buyer agent. Learn more about buyer agency here.